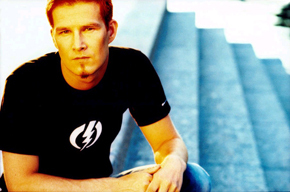 Darude (Finnish artist/producer/dj Ville Virtanen) found dance music while he was still in school. He practically gave himself carpal tunnel syndrome by constantly holding his finger on the pause button of a tape deck trying to catch the latest tunes on his favorite radio show. Darude says his "education" and broad taste in music dates back to those active radio-listening years. He says he gets inspired by other people's great music among other things and I think it's fair to say that he's probably inspired a fair share of aspiring djs and electronic musicians himself, too. It actually took quite a long time for him to realize that he could one day make music of his own. After a friend showed him what could be done with a regular PC and a simple tracker program his studies started going downhill and time spent next to the computer increasing exponentially. He soon moved on to sound modules and samplers in need of better sounds and more variety. These days he's combining the best of both hardware and software tools in making music and performing live. He's considered somewhat of a tech freak wanting to try out the new stuff as soon as he gets his hands on them. The name Darude developed gradually during a long period of time. Ville played one particular song several times in a row at a pre-party at his friend’s house: 'Rude Boy' by Swedish artist Leila K. Friends started to call him 'Rude Boy' which developed to 'The Rude', 'Da Rude' and finally Darude. Darude's career got started after slipping a demo cd to one of his idols, acclaimed Finnish dance producer Jaakko 'JS16' Salovaara who got interested in what he heard and signed Darude to his label 16 Inch Records and produced a track called 'Sandstorm' in co-operation with Ville. 'Sandstorm' went directly to #1 position on the Finnish Dance Chart and dominated that spot for 17 weeks. The song found its way to UK via Internet, was signed by Neo Records and in June 2000 Darude became the first Finnish artist ever to reach top 3 positions on the UK single chart. 'Sandstorm' sold platinum in Scandinavia and Ireland and gold in the UK and Germany. The worldwide sales of 'Sandstorm' is about 1,5 - 2 million units. The single was also the world's best selling 12" vinyl in 2000. The second single 'Feel The Beat' went to #1 on the Finnish Dance Chart, the UK Club Chart, Mixology Dance Chart UK and the Australian Dance Chart. Altogether it conquered the Top3 in ten countries. Darude's debut album 'Before The Storm' sold double platinum in Finland and gold in Canada. The worldwide sales are about 600.000 - 800.000 units. Darude's success around the world kept him on the road performing live for a total of nine months in 2001. In the spring of 2002 Darude finished his seven week Tour de Trance in the USA until taking some well deserved vacation. By summer 2003 Darude had finished working on his second album 'Rush'. The first single from the album is simply entitled 'Music'. The track conquered the #1 position on the Finnish Singles Chart, the Finnish Dance Chart and for eg. on the Polish Dance Chart. The second single 'Next To You' followed its success by taking the #1 position on the Finnish Singles Chart on release. 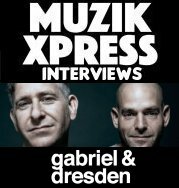 Both singles got supported by some of the biggest names in the dj world (Tiesto, Ferry Corsten...) and were play listed on several dance radio stations all over the world. Again after the album release Darude did a lot of live shows around the globe. In addition to records, clubs and radios you can hear Darude's music in Hollywood movies, ('Ballistic, Ecks vs. Sever', 'Like Mike'), Playstation games, mobile ring tones and in big sports broadcasts like the Olympics and Ice Hockey World Championships. In 2004 the world saw Darude taking another step in his career: In addition to the live performances he also started officially touring as a dj which quickly turned out to be something he really loves, too and now is a inseparable part of his career. His style is a mix of progressive and uplifting melodic trance but he's not too shy to throw in some tech, breaks and house flavor and occasionally even heavy metal samples. His energetic sets have clearly proven people that there's a lot more to Darude than his signature track Sandstorm since only after one year of spinning he was voted #97 on DJ Magazine's Top100 list.